This chapter will look at the way in which the everyday practice of the craft is located within the everyday life of the household; this is owing to the fact that historically the studio or the place of production, and the place of residence were not separate. The practice of craft is an integral site through which relations between kin are not only constructed, but also performed. The physical process of making traces the structural and relational hierarchies that constitute the household. Alongside, the collective vessel of the household becomes a potent means for providing the practice with contexts for dialogue, exchange and ‘growth’. 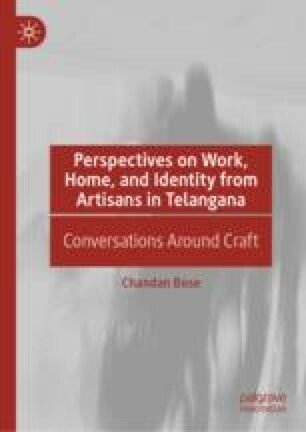 This attempt to look at the ways in which craft practices and kinship practices participate in each other’s narratives creates the grounds for critically formulating ideas about the personhood, gender and inheritance. This chapter is derived, in part, from an article published in World Art on August 1, 2017, available online: http://wwww.tandfonline.com/10.1080/21500894.2017.1347894.